Trinidad Scorpion Moruga Chilli Pepper Grade "A"
Home of the World Super Hot Chilli Pepper's. Firehouse Chilli peppers are highly sought after across the world market place. Guaranteed superior flavor, aroma, purity and fiercely HOT! Trinidad Scorpion Moruga is one of the world's hottest chilli pepper . The Trinidad Scorpion Moruga has rated up as high as 2,009,231 SHU on the Scoville scale, making it one of the hottest chili pepper in the world. Firehouse Chilli Trinidad Scorpion Moruga is directly sourced from the island of Trinidad and Tobago. This ensures a higher purity, aroma, flavour and capsaicin (heat) content. 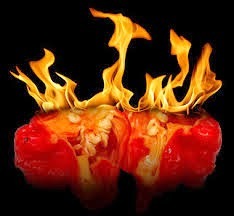 Firehouse Chill Trinidad Moruga Scorpion is thousand times hotter than any other Chilli. The key to this chili pepper is the whole culinary experience. Used in moderation you will get the holy experience of the capsaicin rush(has been described as a edible version of sky diving) and the unique sweet-hot tender fruity and floral flavor. Used unwisely you will get the smack in the face insanely heat searing, sweat inducing, tear generating power of the legendary superhot chili, your face will turn red, the sweat starts to roll, your heart rate will increase, endorphins will be released and a fiery sensation will spread across your tongue and down your throat. You will relish the sweaty addictive pleasure of this scorching chilli. Firehouse Chilli bringing spice to your life.